The Soccer Nation Academy Coach becomes the 1st Kansas Coach to ever win the National award in competitive soccer! Chicago, Illinois -- Luis Padilla is the definition of sportsmanship and he exemplifies it to his players, coaches and parents by example. His core values in his coaching philosophy are respect & discipline. Those values are applied both on the the field of play toward the referees, opponents and coaches and in their everyday lives. Away from the game, they apply them at home with their friends and family because educating players to be a better person in life and to respect others is what Luis is really accomplishing. The challenges faced on the field or in life can be similar as you need discipline to push past those obstacles which will build a person’s character. And that is exactly what Coach Padilla did this summer. The players believe that they can achieve greatness together. They put their whole heart into the game for each other and their coach. Seen as the underdog team in the Kansas State Cup the odds were against them, but they persevered. Earning come from behind victories to be the Kansas State Cup Champions, as their season wasn’t over. Soccer Nation Academy were now facing power house clubs from the Midwest Region but Coach Padilla motivated his boys to persevere again to be crowned Midwest Regional Champions, as their season wasn’t over. Now in Frisco, the team started off very strong and advanced to the Final. Taking the lead in the Under 13 Boys National Championship they seemed to be destined for the dream ending, but unfortunately they faced a talented opponent. Soccer Nation fell 2-1 to a very good Cal-South team. The pain was great among the players but the love from their coach and the bond of this team was too strong to see this as a failure. They lost and their season ended but they also grew as young men on a magical run that test the character of everyone involved. Luis Padilla worked endlessly for his team this past year and made it happen by being active in the community raising funds for his boys to experience this once in a lifetime opportunity. All of this can be seen in a documentary produced by Sprint Latino that takes a look at the magical journey. Luis Padilla deserves the recognition and although he may not want it, that is exact reason why he should receive the honor as the 2018 Competitive Coach of the Year. The above information was his nomination form to KSYSA. It is the reason as to why US Youth Soccer has selected him as the Midwest Competitive Coach of the Year and now the National Boys Competitive Coach of the Year. Click here to see Luis accept his honor. 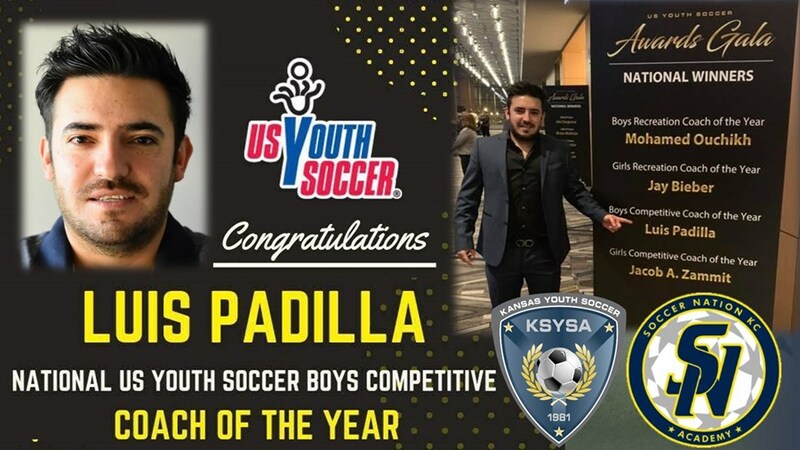 After he accepted his award US Youth Soccer had another surprise for Luis and the other National Coach of the Year award winners. Luis and the rest of the Coaches would be awarded a Coaching Education trip to Barcelona, Spain in January of 2020 sponsored by Premier International Tours. This trip will include touring the facilities and watching the youth academy teams play at FC Barcelona and RCD Espanyol. They will be going to an FC Barcelona women’s game and an official FC Barcelona match at the Camp Nou. Congrats to Luis on this huge opportunity to improve as a coach and see one of the best teams in the world.